What is the best way to get an accurate count? The next national census is two years away, but it is already the subject of a fierce, partisan battle in Washington. The Census Bureau wants to use statistical sampling techniques to try to reduce the “undercount” – the difference between the number of people missed by the census and the number who were counted twice. Scientific experts generally favor this method. So do many big-city mayors and civil rights leaders, who believe that the people most likely to be missed are minorities and the poor, especially in urban centers. But Republicans in Congress say that sampling violates the Constitution's call for an “actual enumeration” of the population and invites political manipulation by the Clinton administration. 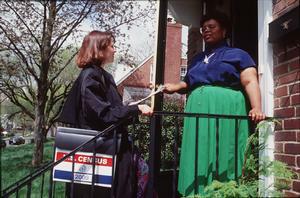 The debate is expected to continue right up to Census Day – April 1, 2000 – and beyond.